Which AGV is Right for Me? 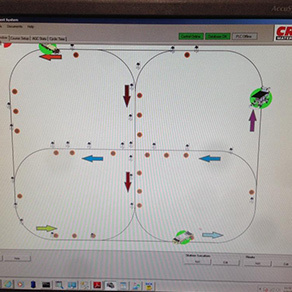 AGV system management and traffic control requirements are project dependent. Creform sales and engineering associates can help determine what level of traffic control is the most cost-effective and operationally appropriate solution for your project. 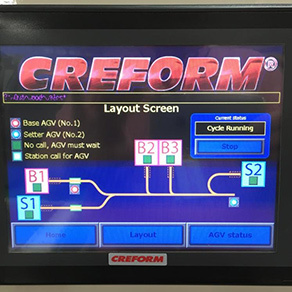 For AGV systems with multiple units, extensive guidepath routes and the need to interface with your plant operating system, Creform has developed PC and PLC based traffic control systems. The AGVs each communicate with this base station via radio link. The base station manages all of the units in the system and each guidepath intersection to ensure the system operates efficiently. 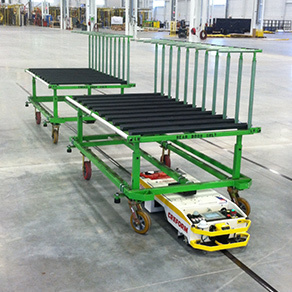 Movement orders are buffered as required and the AGVs are routed in the most safe and efficient manner. The base station typically features a screen for system visualization as well as an administrative interface. 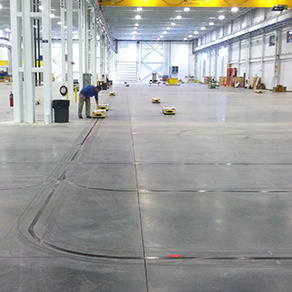 From this location, the plant associate responsible for your AGVs can make system changes, review operating parameters and see reports of directions and faults. Often this base station is integrated into your network for plant system communication.